Seize the freedom of private jet charter and explore endless destinations in just one trip. Travel on your terms with access to 7000+ aircraft and in-house charter specialists who will create a customized flight schedule perfectly suited to your plans. 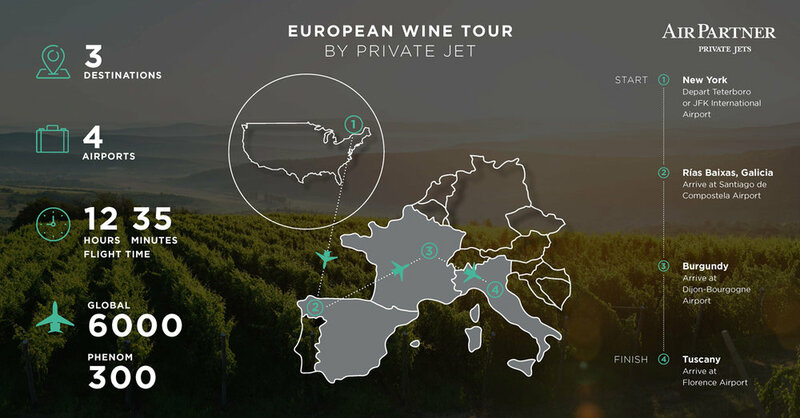 Take a tour through Europe’s very best wine regions. Start in the Spanish Galicia region, anticipated to be one of the most popular destinations for 2019. Journey onto Burgundy, perhaps the closest rival of Bordeaux’s infamous vineyards, and then explore the rolling Tuscan hills, with plentiful wineries and Michelin starred dining. Albariño wine – you can expect to find a dry, aromatic white wine, full of floral, citrus and melon notes, with an overall strong acidity and minerality. Get in touch with us to find out more and book your jets along with these exclusive experiences. Quintessentially Travel (020 7022 6560; info@quintessentiallytravel.com) is the award-winning tour operator and travel agent of Quintessentially, the world’s leading lifestyle and concierge company. Quintessentially membership is not required to book travel and clients will benefit from a personal Travel Specialist who will be on hand 24/7 to craft your perfect escape.